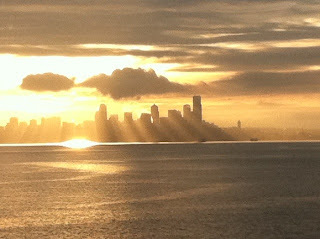 Sunrise over Seattle last week. Last week, I found myself in a few conversations that kept circling around and ultimately landing on the theme of hope. I always find it interesting when "themes" like this emerge in different contexts and with different people. It makes me take note and pay attention. Anyway, it got me thinking about hope and the role it plays in my life (and perhaps yours). All of us have experienced feelings of hopefulness and conversely, hopelessness. Hopelessness can come about because of small annoyances such as a flat tire on the way to an important meeting, or missing a flight because you've misread the departure time or dropping and breaking a favorite heirloom bowl of your grandmother's. When these types of things happen we feel dismayed and a bit hopeless, even as we recognize how trivial they may be. Life takes a wrong turn and momentarily sets us off course. But what about those big moments where hope seems to disappear altogether? For me, this happened when the ICU doctor brought us into a private room and, with tears silently falling down his face, told us that the care Matthew was receiving was "futile care." In that moment, hope flew out the window and stayed away for a long time. For others, it might be hearing the words "it's cancer," or "our marriage is over," or "you're fired." It might be a knock on the door late at night only to find a police officer on your porch. It might be a depression that has settled over you, unwelcome and unyielding. Most likely, all of us at some point will experience moments when life as you know it ceases to exist and you find yourself on a new path that seems dark, foreboding and hopeless. As anyone who has experienced these moments knows, it affects your ability to see beyond yourself and see a future. The hopes and dreams you once had are buried and it's enough to just get out of bed each day and face a world that has been undeniably changed. But one of the remarkable things about humans is that hope does reappear. It may not be for months or even years, but slowly something begins to emerge. It can be triggered by something as "ordinary" as a spectacular sunrise that takes your breath away. It can emerge by witnessing an especially poignant exchange between two people. It can surface by hearing the uncontained laughter of children or the cries of a newborn. Or it can just be that your broken heart feels lighter. Whatever it is, all of a sudden you find that the dark path you've been on begins to have a bit of light shed for you to find your way again. The days that used to stretch out interminably before you now seem shorter and more manageable. Tomorrow seems possible and today seems doable. You have hope again. I can't pinpoint the exact moment when I felt the hopelessness begin to lift and I began to feel hopeful again. It was probably towards the end of that first year. But I did begin to feel my hopes rise again despite the deep loss our family had experienced. Old dreams gave way to new ones, and the path is becoming clearer. There may be setbacks and detours along the way, but at least hope helps me continue on the journey. God put rainbows in the clouds so that each of us-in the dreariest and most dreaded moments-can see a possibility of hope. Robin, you've put something intangible into beautiful, understandable terms. Thank you! Karen, your overall "hopeful" outlook on life (through your blog and just through who you are) has helped me numerous times over the last two and a half years. Thank YOU! Maybe for now, I can hope that in the future I'll feel hopeful again. Reading your blog and the writings of other parents, I see that a times comes when the grief softens and hope begins to return. Thanks for sharing your journey with the rest of us. Thanks so much, Robin, for this deeply insightful and hopeful post. As you know, I've experienced profound hopelessness in the midst of several dark times, and everything you say about hope rings true to me. Coming at this topic from a different—but, I think, related—angle, here's a little story. I recently wrote a book about "healing the heart of democracy" (as you also know). Several times since the book came out, people have asked me, "How can you be hopeful, given the mess our country is in?" My instant response has always been, "Easy. Hope keeps me employed." That may sound glib but I mean it quite seriously. Hopelessness causes me to withdraw myself and my gifts from the world, while hope keeps me engaged with living and giving and receiving—and that's what life's all about. I know hope is hard sometimes, and I've spent many long months underground. But when hope returns—as a result of endurance, inner work, and sheer grace—it is the fuel of life, and life is good. Thank you again, Robin, not only for your words but for what you model in your life. Many blessings to you and your family. It was great to see you in the office and on the ferry two weeks ago! Such beautiful thoughts on the power of hope, Robin. I remember distinctly when hope returned to my life after my brother died...It was as if something lifted from my heart and I began to feel a little lighter. There was no real precipitating event. I was just standing at the bus stop one day and I became cognizant of the fact that I was smiling...feeling happy. So much love to you, my friend. I love that you can remember the moment when you began to feel lighter, Margaret. Humans are remarkably complex and resilient. Sending love back to you, my friend.